Nestled in an isolated valley deep in the extreme north of Puebla’s Sierra Norte, Ahuacatlan may not look like much at first glance. Indeed, for much of the week this small township is a sleepy agricultural community in a hard-to-reach corner of Mexico. Scratch beneath the surface though, and you’ll find a friendly pueblito with a fascinating culture. Ahuacatlan and its surrounding countryside is largely inhabited by the Totonacs, an ethnic group spread across much of the sierra. They’re best known for their intricate embroidery and weaving, which famously impressed the early Spanish missionaries. Along with Totonacs, Ahuacatlan also has a thriving community of Nahuatl speakers. Indeed, the name “Ahuacatlan” is actually derived from Nahuatl, and means “place of avocados”. During most of the week, you won’t see too many avocados around Ahuacatlan – or much of anything, really. All that changes on Sundays though, when Ahuacatlan’s weekly market draws visitors from across the region. The town itself is well located at a crossroads between the larger Zacatlan and a handful of smaller villages, making it an important pit-stop for anyone heading to or from the deep sierra. However, the real reason to check out Ahuacatlan is to catch a glimpse of the town’s Sunday afternoon festival, which kicks off around 3pm. After mass, locals gather outside the town’s main church to let down their hair and party. 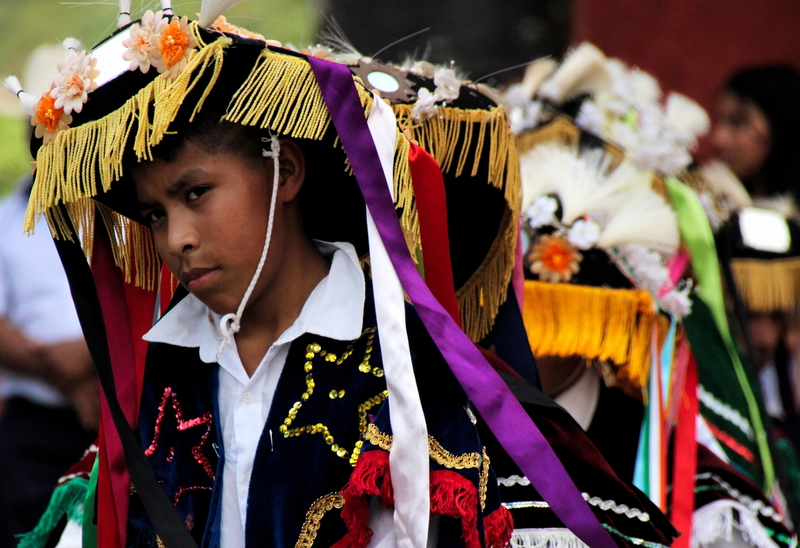 Every town in the sierra has its own unique arsenal of theatrical performances, and Ahuacatlan is no exception. Dancers pound the old stone pavings, with demons, cowboys and religious figures twisting and flowing under the hot afternoon sun. Locals pack in the shade of plastic umbrellas to watch the show over an ice-cream, refresco or sack of popcorn. It’s all quite relaxed, and the extremely friendly locals are always delighted to welcome outsiders. Getting to Ahuacatlan is a little fickle. The easiest option would be to get a colectivo from Zacatlan, though you’ll probably be waiting longer than the one hour trip should take. A taxi is a faster, but outrageously expensive alternative. Either way, staying overnight in Ahuacatlan isn’t impossible, but accommodation is limited to a single hostel. Located ten minutes by foot downhill from the church, the hostel offers spartan yet hospitable lodging for the brilliant price of MX$100 (around US$5).